My new book is a collection of essays, speeches, and other nonfiction of all kinds, called‎ The View from the Cheap Seats. I wrote about everything from reading to music. Here's a playlist loosely inspired by essays and subjects I talk about in the book. It is either willfully eclectic or simply a bit all over the place. Just like the book. I write about Tori Amos and I write about Stardust in The View from the Cheap Seats. There is a connection between them, though: I made Tori into a tree, in Stardust, after I'd showed her some of Charles Vess's paintings. “I want to be that tree,” she said. She finished “Horses” that day, and played it to me in a house built into a bridge. It's almost the 40th anniversary of the Jubilee, and the Queen is still with us. I wrote about my friend Geoff Notkin and how we were 16-year-old punks together in 1977. In 1988 I stayed out all night on the streets of London's Soho. It no longer was a seedy and dangerous place, the kind of place Al Stewart wrote about in this song — the song itself a link between ’60s pop and Gilbertian patter song. Sandman somehow found itself in this song: "the prince of stories who walked right by me.” There's an interview with Lou Reed from 1991 and a piece I wrote when he died. He was important to me in so many ways. I tell the story of my daughter Holly's discovery that she was named after Holly Woodlawn in this song, and why the conversation did not go quite the way I imagined. I put an essay I wrote for the 25th anniversary of TMBG's Flood in the book. I don't remember why or how this song became Terry Pratchett and my theme song on our Good Omens signing tour, so very long ago. We sang it whenever things got stressful or hard, or too silly. I wrote about that in the book. The last time I saw Terry, shortly before his death, we sang “Shoehorn with Teeth” together. It's a strange process finding music to write to. Nyman's Greenaway soundtracks, especially The Draughtsman's Contract, Drowning by Numbers, and A Zed and Two Naughts, are perfect writing music. They take me to a strange new place and they never put me to sleep. I had been going out with Amanda Palmer for years before I attended a Dresden Dolls gig. It made a strange impression on me, and I wrote about it in Cheap Seats. It was also the only time I've ever seen her do this song live: a song I loved long before I met or loved her. I write about Evelyn Evelyn in The View from the Cheap Seats. Amanda's partner in that strange conceptual work of performance art music was Jason Webley. Here's a song I love of Jason's, about graceful ways to leave the stage. I wrote an essay about The Bride of Frankenstein, about its strange oneiric power, about the way the film story tangles in my head like a dream. Here is a track from Waxman's beautiful score. A tribute to Bowie, made after Bowie died, by Jherek Bischoff. I hadn't realized what a sad, haunted song this was. Ash and ashes haunt us all, as death and as rebirth, and as the name of my new son. It seemed appropriate, and a good place to end, as Amanda sings about death, happiness, loss, and time. 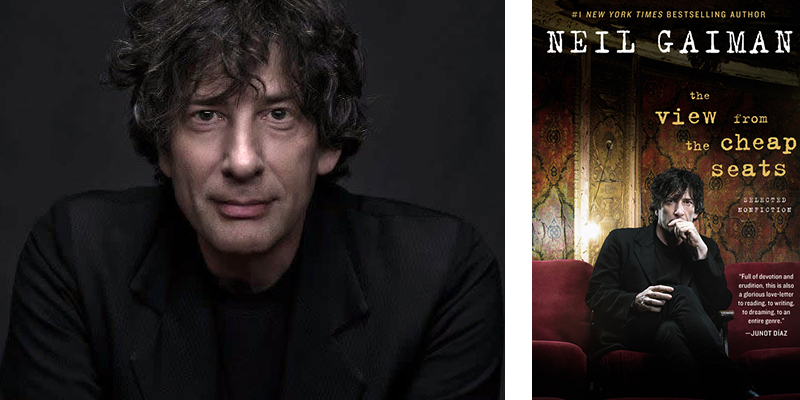 Neil Gaiman is the number one New York Times bestselling author of more than 20 books for readers of all ages, and the recipient of numerous literary awards, including the Shirley Jackson Award and the Locus Award for Best Novelette for his story "The Truth Is a Cave in the Black Mountains." Originally from England, he now lives in America.